GAZA CITY, Gaza Strip -- Gaza militants resumed rocket attacks on Israel on Friday, refusing to extend a three-day truce after Egyptian-brokered talks between Israel and Hamas on a new border deal for blockaded Gaza hit a deadlock. Israel responded with a series of airstrikes that killed at least five Palestinians, including three children, Palestinian officials said. Two Israelis were wounded by rocket fire, police said. The renewed violence threw the Cairo talks on a broader deal into doubt. Hamas officials said they are ready to continue talks, but Israel's government spokesman said Israel will not negotiate under fire. Egypt's Foreign Ministry expressed "extreme regret" over the failure to extend the truce, urged restraint by both sides and called for a new cease-fire to resume negotiations. The ministry said progress had been made in the talks, but did not explain. Later Friday, the Palestinian delegation was to meet again with Egyptian mediators. U.N. Secretary-General Ban Ki-moon expressed "deep disappointment" at the failure to extend the cease-fire and urged the parties to swiftly find a way back to negotiations to reach "a durable cease-fire," U.N. deputy spokesman Farhan Haq said. "The secretary-general firmly calls on the parties not to resort to further military action that can only exacerbate the already appalling humanitarian situation in Gaza," Haq said. "He condemns the renewed rocket fire towards Israel. More suffering and death of civilians caught up in this conflict is intolerable. " Hamas wants Israel to open Gaza's borders, following a seven-year closure also enforced by Egypt, but Israel says it will only do so if the Islamic militants disarm or are prevented from re-arming. Hamas has insisted it will never give up its weapons. The wide gaps became clear at an all-night meeting between Egyptian and Palestinian negotiators that preceded the renewed fire. Hamas negotiators told The Associated Press that Israel rejected all of their demands. Hamas had entered the Cairo talks from a position of military weakness, following a month of fighting in which Israel pounded Gaza with close to 5,000 strikes. Israel has said Hamas lost hundreds of fighters, two-thirds of its rocket arsenal and all of its tunnels under the border with Israel. The heavy toll of the war appears to have made Hamas even more resistant to returning to the status quo. 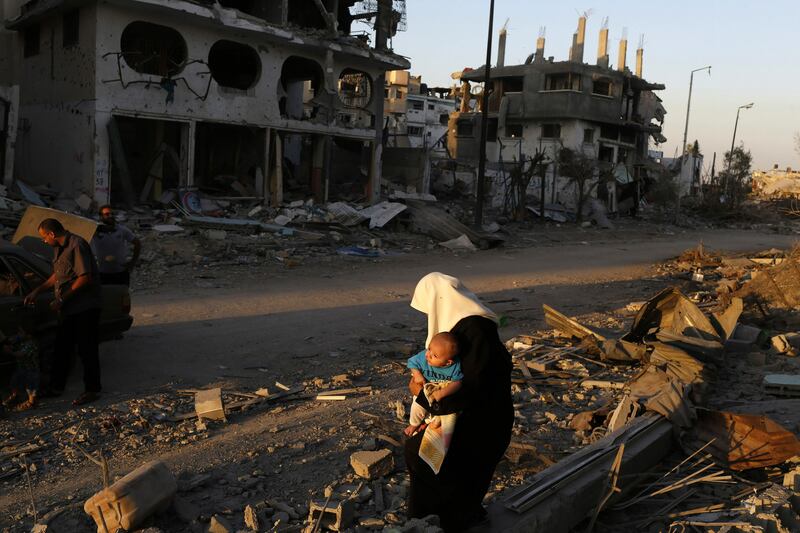 The group is unlikely to accept a cease-fire without assurances that Gaza's borders will be opened - particularly after the fighting left more than 1,900 Gaza residents dead, close to 10,000 wounded and tens of thousands displaced, with entire neighborhoods reduced to rubble. At least 429 children have been killed and CBS News looked at what it's like to grow up in a war zone, for children on both sides of the conflict. At the Shifa hospital in Gaza, the pediatric ward is still packed. Brothers Mohammed, Omar and Moussab Wahdan were all seriously burned and peppered with shrapnel when the house they were sheltering in was hit. Their mother was killed in the strike. Their relatives have decided not to tell them for now. Five-year-old Moussab told CBS News he isn't afraid of the bombs, but he shares the vacant stare of so many children affected by the conflict. Meanwhile in the Israeli town of Hadera, five-year-old Ofek and his two little sisters have been away from their home for a month. Their parents Kobi and Shira Revivo fled from the Gaza border to northern Israel, trying to dodge Hamas rockets. "I am refugee," Shira Revivo told CBS News. "I am completely a refugee." Gaza militants began firing rockets at Israel even before the temporary truce expired at 8:00 a.m. (0500 GMT) Friday. By late Friday, more than 50 rockets had been fired. Two Israelis were hurt, and one of the rockets hit a home, causing damaging, but no injuries. The Israeli authorities banned gatherings of more than 1,000 people in Tel Aviv, Jerusalem other areas within 80 kilometers (50 miles) of the Gaza border because of the rocket fire. The rockets appeared to have been an attempt by Hamas to exert pressure on Israel without triggering a major escalation. Smaller Gaza groups claimed responsibility, while there was no word from Hamas rocket squads. However, Israel said it will not negotiate under such terms. "When Hamas broke the cease-fire, when Hamas launched rockets and mortar shells at Israel, they broke the premise of the talks," said Israeli government spokesman Mark Regev. "There will not be negotiations under fire." The Israeli delegation to the Cairo talks left Egypt on Friday morning, and it was not clear if it would return. Israeli aircraft, meanwhile, struck about 40 targets in Gaza, the army said. Palestinian officials said at least five people were killed in three separate strikes, two of them near mosques. Among the dead were three boys, a 10-year-old and two cousins, aged 12. At least five boys were wounded. The deaths brought the overall Palestinian toll since July 8 to 1,902, said Palestinian health official Ashraf al-Kidra. Another strike hit a house belonging to members of the Zahar clan, one of the largest in Gaza City's Zeitoun neighborhood. Senior Hamas leader Mahmoud Zahar also belongs to the clan, but the degree of relation to those in the house was not known. Police said the house was struck without warning, and rescue services later said three women and a 5-year-old boy were injured. The current round of fighting is the third in just over five years. The war grew out of the killing of three Israeli teens in the West Bank in June. Israel blamed the killings on Hamas and launched a massive arrest campaign, rounding up hundreds of its members in the West Bank, as Hamas and other militants unleashed rocket fire from Gaza. Israel launched an air campaign on the coastal territory on July 8 and sent in ground troops nine days later to target rocket launchers and cross-border tunnels built by Hamas for attacks inside Israel. On the Israeli side, 67 people - including three civilians - were killed in the past month. Much of the country was exposed to fire, with Gaza militants firing thousands of rockets and mortar shells. Israel said it was going after Hamas targets, including rocket launching sites, and estimated at least 40 percent of the dead were militants. The U.N. said most of those killed in Gaza were civilians and that in dozens of cases, strikes hit family homes, killing multiple members of the same family at once. Previous rounds of Israel-Hamas fighting ended inconclusively, setting the stage for the next confrontation because underlying problems were not resolved, particularly the stifling border closure of Gaza. Israel and Egypt imposed the blockade after the Hamas takeover of Gaza in 2007, and have since enforced it to varying degrees. The closure led to widespread hardship in the Mediterranean seaside territory, home to 1.8 million people. Movement in and out of Gaza is limited, the economy has ground to a standstill and unemployment is over 50 percent. The militant group has said it is willing to hand over some power in Gaza to enable its long-time rival, Western-backed Palestinian President Mahmoud Abbas, to lead reconstruction efforts, but that it would not give up its arsenal and control over thousands of armed men. After four weeks of fighting in the Gaza Strip, most Americans side with Israel in their ongoing disputes with the Palestinians, according to a new CBS News poll. Fifty-four percent of Americans say they sympathize more with Israel, while just 16 percent sympathize more with the Palestinians.